Xerxes in Chryse is a party quest centered around the El Nath Mts. 's Chryse region, and is accessible via Spiegelmann's Guest House via the Dimensional Mirror. 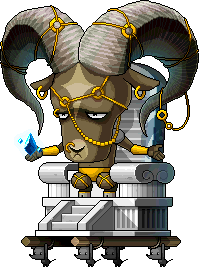 The objective of Xerxes in Chryse is to help Michaela defeat her corrupted pet goat Xerxes and put an end to his tyranny in Chryse. When you first enter, you will encounter a large slab of rock. Press the down and right arrow keys to crawl under it. Then, climb up the vines, and you will see a large area of rocks that you need to place vines on to climb. To do so, press the space bar (or the button you use as NPC Chat/Harvesting) on top of one of the bushes you see nearby, move to the spot, and press the button again. You will need to do this 4 times to move on. Afterwards, climb the vines and you will advance the next stage. In this stage, you will be given a new grappling hook, which can be used by pressing the space bar (or the button you use as NPC Chat/Harvesting). Various monsters will spawn in multiple waves throughout this stage, with several Weapon Dummies appearing throughout the stage, appearing on one side and moving all the way to the other side. These cannot be killed, and touching them will do 10% of your HP as damage, as well as stun you. After you kill all the other monsters in this stage, you can advance to the next stage. In this stage, a spinning column with spikes will appear on the bottom, and you will need to use your grappling hook to hoist yourself to the top of the map and reach the next stage. This is the final stage of the Party Quest, where you fight Xerxes. He can reduce your vision, seal, and blind, reducing your accuracy. He can also summon Kephivaras and Tragos. Once you defeat Xerxes, you will have 30 seconds to pick up any Soul Shards that may have dropped before being transported to the bonus stage (or you may enter the portal on the right side to do that manually). In the bonus stage, you can jump down and collect Chryse Core Fragments, while using your grappling hook to lift yourself back up. You have 30 seconds to claim as many as possible. If you fall, you will be sent to the exit map. Spawns in Stage 1. Cannot be killed with normal attacks, requiring the use of a harpoon to kill it. These can be ignored, however. The boss of the PQ. Spawns in Stage 4. Summoned by Xerxes in Stage 4. This page was last edited on 8 March 2018, at 05:40.